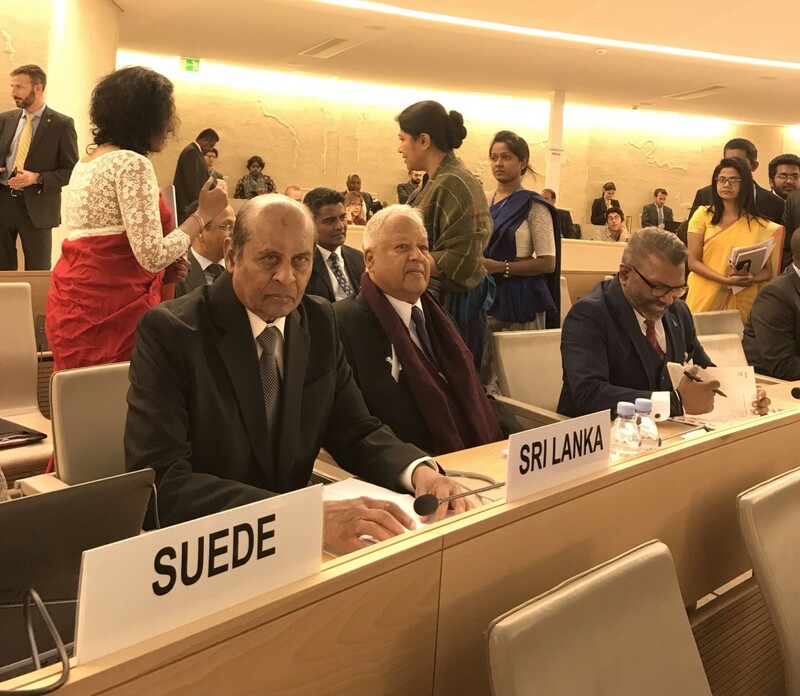 Sri Lanka’s foreign minister spoke out against a hybrid accountability mechanism at the United Nations earlier today, in a statement that also lashed out at the UN human rights chief’s report on the island. Thilak Marapana said “at the highest political levels” the Sri Lankan government has reiterated there were “constitutional and legal challenges that preclude it from including non-citizens in its judicial processes”. The inclusion of foreign judges in a criminal justice process for violations committed at the height of the armed conflict is a key operating paragraph of a UN resolution that Sri Lanka co-sponsored in 2015. However, several senior Sri Lankan leaders have repeatedly spoken out against such a process, with Sri Lanka’s president vowing that members of the armed forces will not be taken before a war crimes tribunal. Marapana said he wished to “make it clear” and that Sri Lanka’s position had been expressed “both publicly and in discussions with the present and former High Commissioner for Human Rights and other interlocutors”. “It has been explained that if non-citizen judges are to be appointed in such a process, it will not be possible without an amendment to the Constitution by 2/3 of members of the Parliament voting in favour and also the approval of the people at a referendum,” he added. In his statement to the UN Human Rights Council, Marapana went on to criticise several aspects of the UN High Commissioner for Human Rights’ report on Sri Lanka, which raised concerns over the on-going reports of abduction, torture and sexual violence, institutional failures within the criminal justice system, ongoing harassment of human rights defenders since 2015 and the military’s continued occupation of civilian land. In a seeming rebuke to the High Commissioner Michelle Bachelet, who had earlier called the appointment to a senior position in the Sri Lankan Army of Major General Shavendra Silva “a worrying development”, Marapana stated, “it must be asserted that there are no proven allegations against individuals on war crimes or crimes against humanity in the OISL report of 2015 or in any subsequent official document”. “It is an injustice to deprive any serving or retired officer of the Sri Lankan security forces or the police their due rights,” he added. Marapana went on to defend the Sri Lankan military, stating that “the action by the Sri Lankan security forces during the conflict was against a group designated as a terrorist organisation by many countries, and not against any community”. “All communities in Sri Lanka were united against terrorism, and now that terrorism has been defeated, all communities are working in unison towards reconciliation and economic progress,” he added. He also rejected reports of state-sponsored colonisation of the North-East, claiming that Colombo does not follow such a policy. Though the minister said “clearly and categorically” that land was not being grabbed under the guise of forestry or archaeological projects, his statement immediately adds, “however, it must be born in mind that the protection of forest land and archaeological projects is an obligation cast on any State”. The minister also rejected the High Commissioner’s call for the establishment of an OHCHR office on the island, stating that “Sri Lanka does not believe there is justification” for such a presence. “As a sovereign state, Sri Lanka must set its priorities in addressing the well-being and sustainable peace for her people, as a sovereign state,” the statement concludes.